This article is an update version of my previous article CY13-Q1 Community Analysis — OpenStack vs OpenNebula vs Eucalyptus vs CloudStack. Readers who are intested in further discussions please contact me via email at the above-mentioned address. A Chinese version of this article is published at the same time, which can be found at CY13-Q2 OpenStack, OpenNebula, Eucalyptus, CloudStack社区活跃度比较. It should be noted that this community analysis project was initiated in CY11-Q4, and this particular report is the 7th quarterly report being published since. Although the author became an employee of Eucalyptus Systems Inc in October 2012, the opinion presented in this report belongs strictly to the author rather than the employer of the author. It should also be noted that the employer of the author completely agreed that the author could continue this project with an independent perspective. Starting from CY13-Q2, the OpenStack project kicked off the Ask.OpenStack, which is now included as a data source for this analysis. It should be noted that there exists significant membership overlap between Ask.OpenStack and other OpenStack mailing lists and forums. Due to time limits we were not able to carry out membership de-duplication for this data source. We will try to deal with that in our CY13-Q3 report. 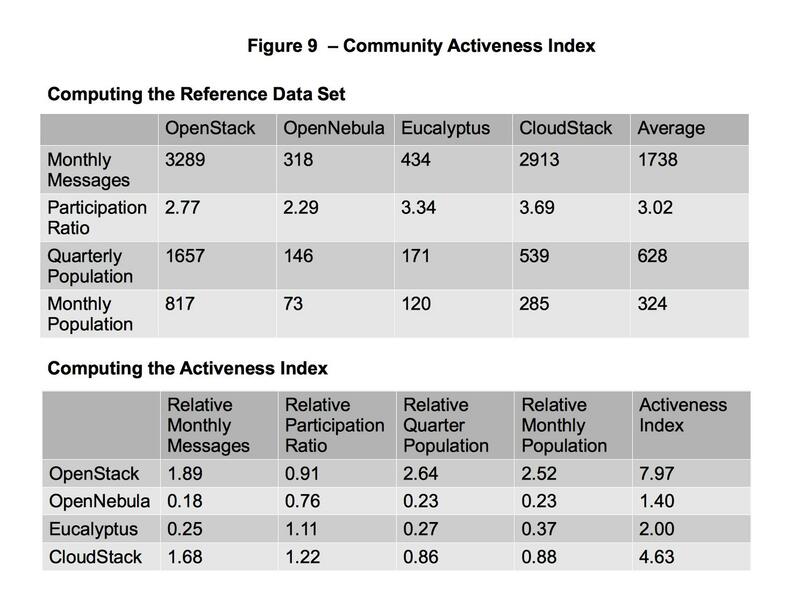 As can be seen from Figure 3, during the past 12 months the participation ratios of CloudStack and Eucalyptus were relatively higher, which were close to 4; the participation ratios of OpenStack and OpenNebula were relatively higher, which were close to 4. It should be noted that although the number of active participants of the CloudStack project is somewhat smaller than that of the OpenStack project, both projects have approximately the same amount of discussions. The above-mentioned calculation of “Community Activeness Index” uses both the active population of the past quarter and the active population of the past month, which are quite similar in nature. In our CY13-Q3 report, we will use only the active population of the past quarter. Also we will use quarterly messages to replace monthly messages, and use quarterly participation ration (post-to-thread ratio) to replace monthly participation ratio. We are seeing increasing number of suggestions to analyze the git activities of these open source IaaS projects. We also noticed that all of these four projects use git as the SVM for their source code. Starting from our CY13-Q1 report, we tried to do some basic analysis base on the git log data. 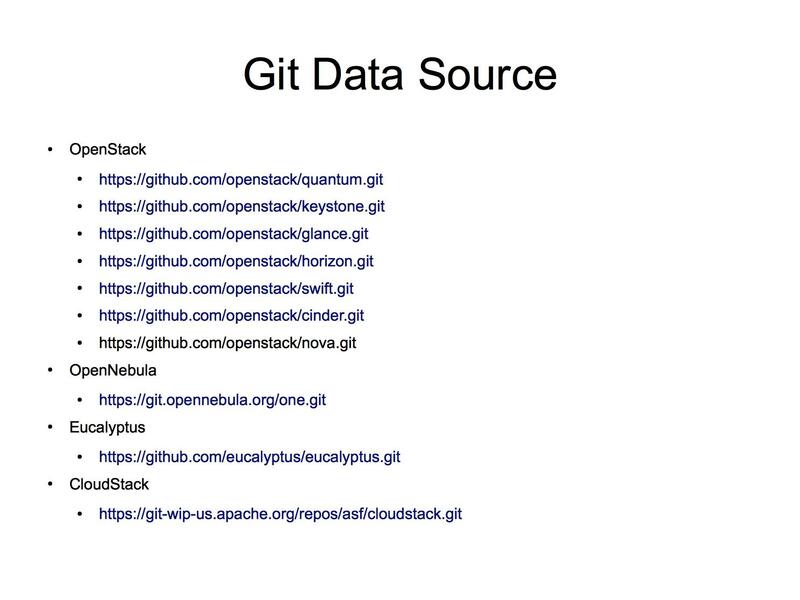 It should be noted that for the OpenStack project, the data source includes the Cinder, Glance, Horizon, Keystone, Nova, Quantum and Swift sub-projects hosted on github.com. Figure 10 shows the monthly number of commit operations for these four projects. 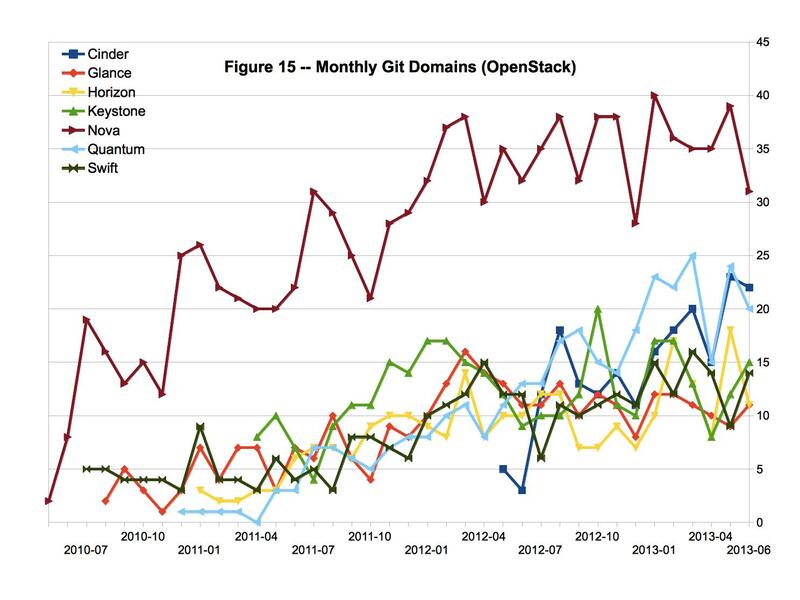 Generally speaking, the commit frequencies of the OpenStack and CloudStack are relatively higher. During the past 12 months, both projects maintained a commit frequency of about 600 commits per month. Eucalyptus was also committing frequently, with significant fluctuations from month to month, which seems to be a typical batch-commit behavior. 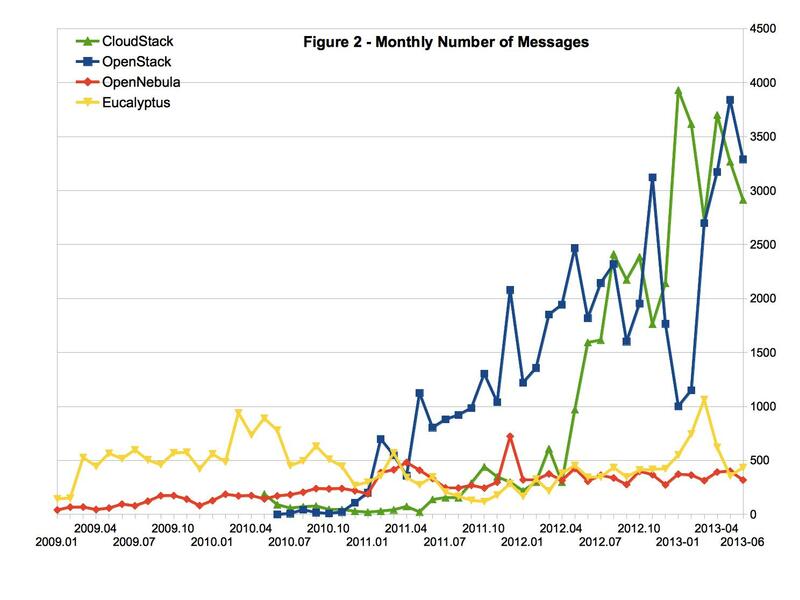 The commit frequency of the OpenNebula project is relatively small, with an average of 200 commits per month. Figure 12 shows the monthly number of contributors (identified by unique github.com accounts) for these projects. 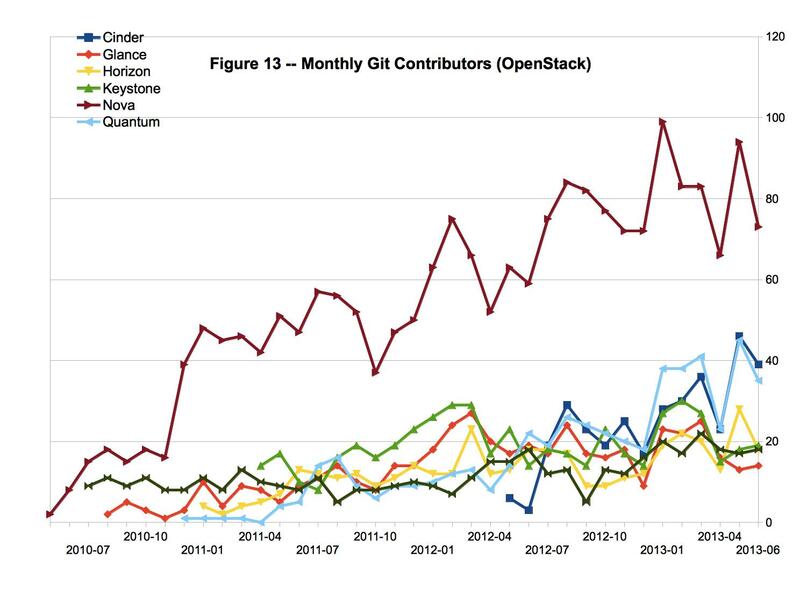 Generally speaking, the number of OpenStack contributors is much higher than the other three projects, and is growing rapidly. The number of CloudStack contributors also exhibits some growth, but the growth is relatively slow. The number of Eucalyptus and OpenNebula contributors is relatively small, and does not exhibit significant growth during the past 12 months. The following table lists those institutes that make the most contributions to these projects during CY13-Q2, according to the number of commit operations, along with the percentage of their commit operations. It can be seen that both Eucalyptus and OpenNebula are open source projects dominated by single institutes, while CloudStack and OpenStack are open source projects contributed by multiple institutes. For the CloudStack projects, influence from Citrix is quite obvious, over 51% of the commits come from accounts belonging to citrix.com and cloud.com. 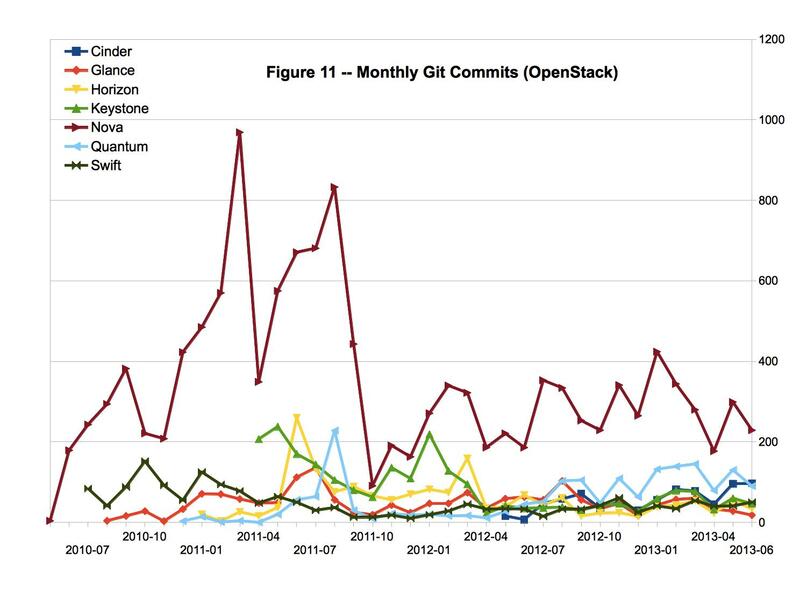 For the OpenStack project, ivm.com contributed 14 of the commits, redhat.com contributed 12% of the commits, mirantis.com contributed 9% of the commits, and hp.com contributed 5% of the commits. The following table lists those institutes that make the most contributions to the sub-projects of OpenStack during CY13-Q2, along with the percentage of their commit operations.